I have been living out of my suitcase for the past month or so. When I say that, I do actually mean that I am out somewhere, and not my usual “pack for 2 hours, but unpack for 2 weeks” self. 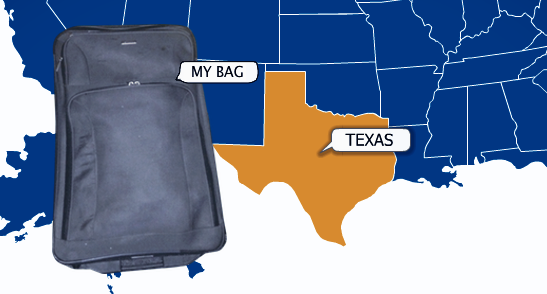 Luckily, in all of this, my suitcase is the size of Texas. It does not matter which state I am in because I always seem to have a plethora of cowboy hats and cacti in my bag! Sometimes with such a large bag, it even starts its own “Yo suitcase so fat” jokes! Luckily, with this ginormous bag, I have yet to have any flying problems with it. The only real problem I have ever had with baggage was when I went to Nicaragua in June. It was a bag that our group took that contained about 50 Spanish Bibles in them. The bag did not make it to the country, which caused us all to be very disappointed. Out of the grace of God though, the camp we slept at had a box left from another church. What did it contain? About 50 Spanish Bibles. Is that not amazing?! God always takes care of our baggage. Sometimes in our lives we have these giant bags the size of Texas that follow us around from past decisions, relationships, or even just our own thoughts. We like to pack our lives with as much as we think we can handle. The funny thing is that our lives can actually compare to packing a car. Whenever we go on trips, our car is filled to the brim with luggage. The trunk, backseat, and floorboards are full. We have bags falling down on us at every red light, and we have Tetris games to play every time we get back into the car. We switched to a bigger car. We went from our small car to our giant, yet fashionable station wagon. We sacrificed air conditioning, working windows, better speakers, and our dignity for the sake of our baggage. It had me thinking about what in our daily lives do we sacrifice to fit the needs of our problems? Sometimes we give up things to fit all of our baggage into our trunks. We lose our friends, our self-image, our attitude, and more. We are upgrading our space and losing our perks for our baggage all while the easiest thing to do is to pack less! God will carry it for you. Unloading our baggage is actually not very difficult. You can do so many things to unpack! It is important to admit that we need God’s help. He can take it all away! It is important to accept the responsibilities that our baggage entails. It is important to surround ourselves with Christlike people. It is important to have discipline to clean out your bags. You can get rid of your baggage. You can throw it all off to start again. With enough effort and faith, you can rely on the Lord to clean out your trunk. You might have to take the fall of your choices or change your daily actions, but the end is so worth it. Take that bag the size of Texas and dump it. You can go anywhere now. This was actually really helpful.